One way to tell how my Genius Project activities are going is to see how late in the month I do the update for the previous month. Usually, the later in the month that I get my update out, the worse that particular month is going. July was my worst month so far. Until August, that is. I spent a total of 10 hours on the Genius Project in August. Yes, I managed to do even less writing in August than my previous lows. And I didn’t see any theatre at all in August. That doesn’t mean that I am giving up on the Genius Project. I’m still trying to find the sweet spot of getting activities done and juggling my current “day job”. It was easy to do the Genius Project when I didn’t have to spend time at another job. Although, it sometimes seemed challenging to make my quota even without the time and energy drain of other work. Perseverance trumps talent is my mantra. Practice over product. So, when things seem to make it harder to keep moving forward, take smaller steps. The bottom line is that even only 10 hours is better than no hours. The real disappointment is that I spent less than 2 hours writing in August. But I’m over it. Keep moving forward. I am going to try to get 1 page of writing in a day, instead of focusing on how much time I spend writing. And I will try to get that page written as early as possible. It is a good day when I’ve got that writing done and out of the way. Until I rebuild my habit of writing regularly, I won’t worry about the ratio of writing to reading and/or watching theatre. Reading and watching feeds the writing. At the end of the month, I started reading a book called Inside The Box by Drew Boyd and Jacob Goldenberg, which is about creativity. They propose that the concept of thinking “outside the box” is less conducive to creativity than thinking “inside the box” and using the environment around you (“the closed world”) for solutions. I’m eager to finish the book and see if I can find applications to my writing. 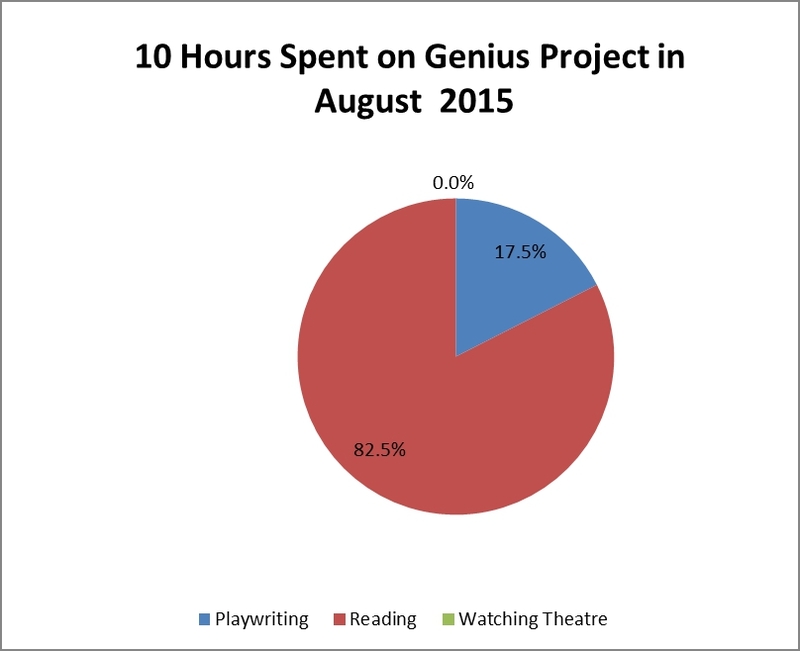 Total hours to date on the Genius Project are 794.75. Only 9205.25 more hours to go!